The first month of 2014 hasn’t even come to an end, but we’ve already been flooded with records and new music that are setting the tone for the year ahead. In what will be a regular column of sorts, here we take a look at some new releases that have just landed on our collective laps all from different corners. 2014 is already looking well for black metal with a couple of high profile releases on the way in the coming months. Not so much on the radar is Idaho-based label Sol y Nieve, who are releasing the Nemorensis album The Lady in the Lake, an adventurous 27 minute excursion into the murky abyss. First we’re enveloped by swelling drones that grow in intensity and frankly, is anything but black metal but this creeping wall of sound is laying out its cards as eerie chanted hymns start emerging from the fog. As the minutes trudge on and the atmosphere grows tenser, Nemorensis eventually morphs into a familiar beast, where piercing lead guitars begin rupturing this droning ambience and soon lo-fi juddering raw black metal takes control. The vocals are buried deep in the mix, sounding like a tortured soul in the depths beneath a mire of frosty guitars and waves of noise. The guitars remain the focal point but it’s around the 13 minute mark that Nemorensis start throwing some spanners into the works with more meandering synths washing over the wretched howls that start dying away into the cloudy murk once again. Gentle tribal-like drums now return us to the hypnotic vibes of Lady in the Lake’s opening moments, but with an altogether more tranquil vibe. The now all-too familiar guitars and vocals start blossoming again but in a decidedly slower and more reserved fashion, recalling some of the most beautiful depressive BM. Lady in the Lake is an album of defined sections and chapters. It could have been separated into three tracks but Nemorensis have opted for one complete suite, which doesn’t hamper its end result and is still best enjoyed as one whole piece – one of the first really exciting black metal releases of 2014. Finland’s stoner metallers Altar of Betelgeuze just recently dropped their first album, Darkness Sustains the Silence through Memento Mori. With an official release date of January 1st, the band seemed eager to hit the ground running with this first long player. They’re an unfamiliar name broadly speaking and with this album, they’ve made a valiant effort that deserves a few hat tips in their direction but the record falls down in the area of quality control. 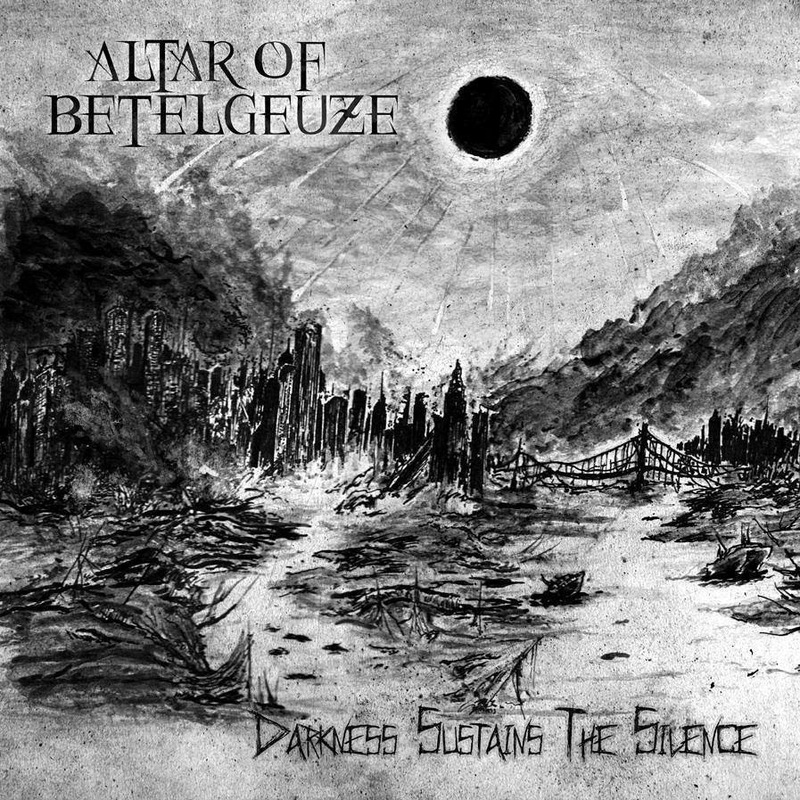 Clocking in at an hour and bustling with heaving slabs of sludged-out doom, Altar of Betelgeuze have made their influences and intentions quite clear. First track proper ‘A World Without End’ certainly makes for a promising start but the band often recoil back to trusty tools. Hefty riffs from the Sleep, Electric Wizard et al academies rule the roost on this one with the vocals swaying between upbeat melodic yells to guttural deathly growls. On paper it all sounds great and at certain moments it is, see ‘The Spiral of Decay’, and if AOB trimmed some of the fatty tracks off this LP, it could have really been onto something but it rather becomes a slog after the midway point, especially when the 17 minute title track closer comes bounding in. Australia’s death metal credentials hardly needs verifying these days with Portal, Grave Upheaval and StarGazer all in tow, turning some more ears to Australia’s underground along with their established black metal and black-thrash scenes (Gospel of the Horns, anyone?). Abysmal Sounds are offering up the new record from New South Wales’ Innsmouth, Consumed By Elder Sign. They are a band clearly infatuated with all things old school (and Lovecraft too it would seem). Where the likes of Portal and StarGazer take their respective paths through murky, experimental terrain, Innsmouth opt for a clearer, straight-forward approach with no messing about, which is both to their benefit and detriment. The former because Innsmouth stay focused on the task at hand, delivering crunching mid-tempo DM with nods towards their elders. The latter because the album can become samey at times, never straying too far from the bone covered path that adorns the album cover. That said, ‘Dead In The Water’, the record’s opener lays down an almighty gauntlet to begin with hooky riffs to complement the caustic barking vocals. The guitars are a definite focal point for this band, really drawing attention more so than the vocals, like the punishing ‘Five Branches Against Doom’. Overall, it’s a solid release from these Aussies for what is their debut full-length. Gnaw Their Tongues, the black metal/noise project of Dutchman Mories, has made a career for himself out of all things weird and making listeners uncomfortable, see Spit At Me and Wreak Havoc on My Flesh or All The Dread Magnificence of Perversity for prime evidence. He’s also begun having a penchant for collaborative projects, releasing a short one-off track last year with Dragged Into Sunlight. Now he has joined up with Belgium’s vile sludge band Alkerdeel for the brief, but no less striking, record Dyodyo Asema. It’s just 20 minutes long, and one track, but this all that Alkerdeel and Gnaw Their Tongues need to envelope the listener in a world of mysterious darkness. Both respective entities have black metal strains in their blood but neither are explicitly BM, rather using the element as one more layer on deeply uncomfortable sounds. This certainly manifests itself on Dyodyo Asema with creeping electronics, agitated guitars and miasmic vocals. This collaboration isn’t for the faint of heart and definitely won’t win over anyone that hasn’t been previously taken by the horror of Gnaw Their Tongues but for the initiated it’s business as usual and business is grim. Finally, Abbotoirwere the first Irish band to release something this year, with Reclaim, a hefty one track accompaniment to last year’s impressive MCMXV album. The Belfast funeral doom trio had been threatening to release something special for some time and MCMXV was just that with two deathly tales near thirty minutes each. Reclaim, with its track ‘Descension’, more or less picks up where that release left off and feels like a leftover cut that didn’t make it onto the album but was too good, and too long, to leave to waste. Stream the track in full below as Abbotoir are one band definitely worth keeping an eye on this year.